This Couleur Caramel Light Beige BB Cream n°11 30ml leaves you with an harmonious and unified complexion for a natural result. Thanks to its formula enriched with organic Argan oil and hyaluronic acid, it is perfectly suitable for all skin types. Try it now! 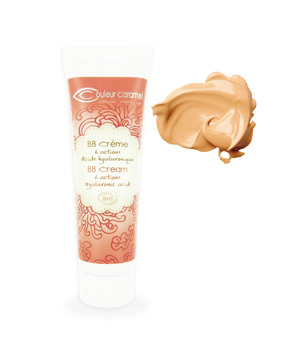 This BB cream regenerates, hydrates, protects, illuminates, refines and unifies the skin. Light Beige retrievable on https://www.mondebio.com/recherche.php?rech=BB+Cr%C3%A8me+n%C2%B011+Beige+clair+30ml. Gold Beige retrievable on https://www.mondebio.com/maquillage-bio/couleur-caramel/bb-creme-n-deg-12-beige-dore-30ml/18139.html. Sun Beige retrievable on https://www.mondebio.com/maquillage-bio/couleur-caramel/bb-creme-n-deg-13-beige-hale-30ml/18140.html. [+/– MAY CONTAIN : CI 77891 (Titanium dioxide) – CI 77491 (Iron oxides) – CI 77492 (Iron oxides) - CI 77499 (Iron oxides)]. *Hydration of the upper layers of the epidermis. Apply the BB cream to your whole face until full penetration. This BB cream can replace your day cream or be combined with your foundation. Multi-brand cosmetics and certified Organic products shop. More than 6000 Organic cosmetics, and more than 230 Organic brands.